Recently a good friend of mine told me about the Clean 15 and Dirty Dozen like it was something she thought I already knew, I felt bad that I didn’t.However the Creator is bountiful. I was searching my files to post a smoothie recipe on Facebook and came across this asparagus recipe remedy of mine called Asparagus Menopause Smoothie, but you guessed it, that’s another post. 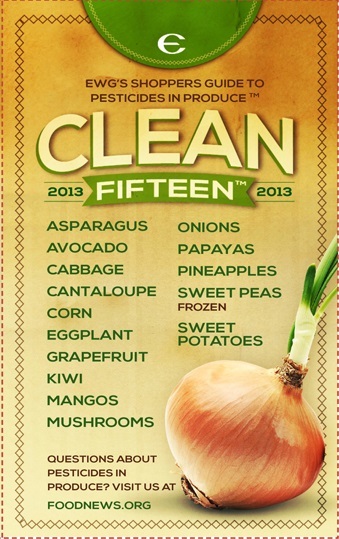 Researching further the health benefits of “asparagus” I was happy to find out that it is part of the Clean 15 ! Identified by the Enviromental Working Group as one of the safer foods you can buy anywhere.Once again I am saving this image in my phone so I know what’s OK to buy whenever I’m out and about. By sharing positive information we can help each other happily and healthly through this new millenium insha’allah.